The islands of the USVI and the BVI are so close together that from one spectacular spot to the next is often only a 5 to 10 mile sail. 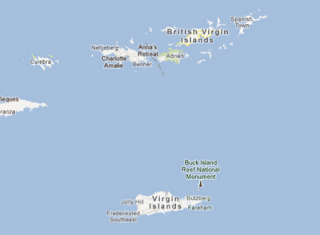 St. Croix is about 35 miles away so that puts it apart from the rest. It is part of the USVI. We hadn’t heard from anyone who had been there so we decided that we needed to visit. The added bonus is that it is directly south of where we were so the easterly trades would give us a beam reach coming and going. 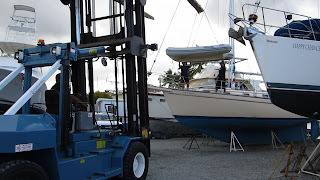 We are coming to the end of our 2011/2012 cruise and we have spent much time motoring and motor-sailing so the thought of a serious sail was inviting. We left Peter Island in the BVI at 7 am and sailed due south averaging more than 6 knots for the trip. The entrance into Christiansted, St. Croix, is well marked – there is a serious shoal right in the entrance to the harbour and there are many, many buoys. So many, that Glen did several U-turns before we finally made our way in. Customs and Immigration clearance was painless and we were soon in Murphy the Dinghy, heading for the Fort Christian Brew Pub. From the mooring field, you dinghy past Fort Christian to the promenade along the front of the town harbour. We tied Murphy off to the dock and took a short walk along the waterfront before Glen was overcome by the heat and we had to stop for rehydration at the brew pub. We made arrangements with a local car rental place to get a car in the morning and then retreated to the boat for a delicious Pamacita Jambalaya. In the morning we set off to collect our rental car – only to be hit by the only negative on this trip. Any drivers other than US are required to purchase ($20) an “international drivers license.” Now, we’ve driven many places in the world, Europe, Mexico, and the good old USSA, but we have never been required to pay for an “international drivers licence.” Anyway, the rental clerks were nice – not their rule – so we paid and off we went. There are lots of great sights to see in St. Croix. We toured the grounds of the Buccaneer Hotel – fantastic views! We went out to Point Udall, passing an 82-foot dish antenna which is part of the Very Long Baseline Array – cool to see it moving and adjusting. We followed the south coastline and passed the huge HOVENSA refinery on our way to the Cruzan Rum Distillery. It’s not well marked on the road – you have to be careful or you will drive past it – like we did. Did the obligatory rum tour, tasting and purchasing and then spent a lovely afternoon touring the island. We did a quick drive through Fredericksted on the west coast and had a super lunch on the beach at Rhythm's Beach Bar. A beautiful setting right on a beautiful beach. We drove the route of the St. Croix Triathalon and saw “The Beast,” a steep, steep hill. We drove down the hill, the competitors drive up the hill. It has got to be gut wrenching. We ended up back in Christiansted, stocked up on a few groceries and retired for a peaceful evening back on sv Blue Pearl. Our sail back to St. John was as smooth as our trip down. We caught no fish but enjoyed a lovely beam reach all the way at 6 plus knots. We had heard that Coral Bay on the southeast corner of St. John was a nice anchorage but there must be two of them – one way nicer than where we ended up. We left and headed south and west for another couple of miles and spent the night on a mooring ball at Salt Pond Bay. Considered to be one of the best snorkeling locations on the island, it was busy with guests arriving by car and with 3 other boats on mooring balls. We did lots of swimming and snorkeling in this beautiful spot. We recommend St Croix. Now we can say we are Cruzan Cruisers!